Perfect for Dry or Damaged Hair! This silicone-free formula provides the perfect level of hydration to protect and soften strands, leaving them shiny and more manageable. Formulated with organic rose water and apricot kernel oil, this hydrating, lightweight styling product is ideal for revitalising dull, dry hair. Aloe Barbadensis Leaf Juice (Aloe)*, Rosa Centifolia Flower Water (Rose)*, Coconut Alkanes, Glycerin*, Cetearyl Alcohol, Coco-Caprylate/Caprate, Behentrimonium Methosulfate, Behentrimonium Chloride, Cetyl Alcohol, Stearyl Alcohol, Helianthus Annuus (Sunflower) Seed Oil*, Panthenol (Vitamin B5), Sodium PCA, Pelargonium Graveolens Oil (Geranium)*, Gluconolactone, Citrus Aurantium Dulcis (Orange) Peel Oil*, Sodium Benzoate, Prunus Armeniaca (Apricot) Kernel Oil*, Theobroma Grandiflorum Seed Butter (Cupuaçu)*, Borago Officinalis Seed Oil (Borage)*, Calcium Gluconate, Xylitylglucoside, Anthemis Nobilis Flower Oil (Chamomile)*, Anhydroxylitol, Xylitol, Limonene+, Citronellol+, Geraniol+, Linalool+, Citral+. Apply to damp or dry hair, focusing on damaged or frizzy areas such as the ends. 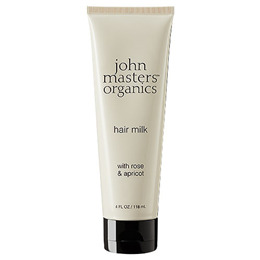 Follow with any John Masters Organics styling products. Below are reviews of Rose & Apricot Hair Milk - 118ml by bodykind customers. If you have tried this product we'd love to hear what you think so please leave a review. Really good product, helps my coarse dry hair look silky and separated.